Heat oven to 375°F. Spray 13x9-inch (3-quart) glass baking dish with cooking spray. In 12-inch skillet, heat 1 tablespoon of the oil over medium-high heat. Add half of the mushrooms; cook, stirring occasionally, 4 to 6 minutes or until tender. Spoon into medium bowl. Repeat with 1 tablespoon oil and remaining mushrooms. Add 1/2 teaspoon salt to mushrooms; toss to coat. In large bowl, combine the potatoes, garlic, rosemary, remaining 1 1/4 teaspoons salt and the pepper. Stir until potatoes are coated with seasoning. 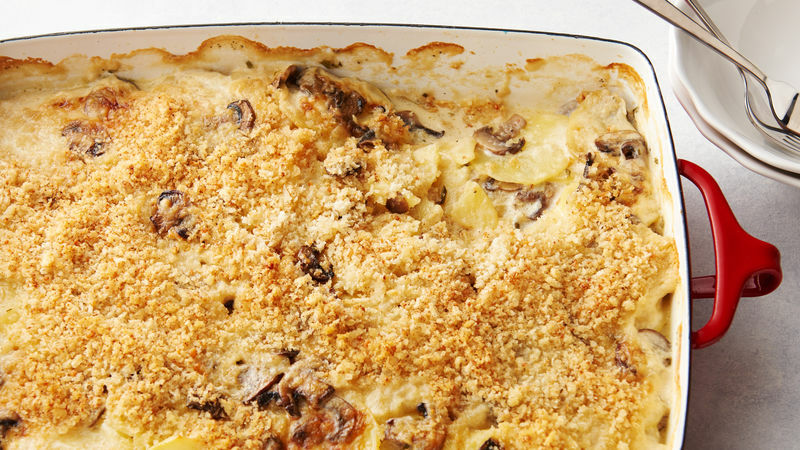 Layer half of potatoes, half of mushrooms and half of Swiss cheese in baking dish. Repeat layers. Pour cream and broth over potato mixture in baking dish. Bake uncovered 30 minutes. In small bowl, combine bread crumbs, Parmesan cheese and remaining 1 tablespoon oil. Remove baking dish from oven; sprinkle bread crumb mixture over top. Bake uncovered an additional 35 to 40 minutes or until potatoes are tender and top is golden brown. Let stand 15 minutes before serving. We used white button mushrooms for this recipe, but if you like a more pronounced mushroom flavor, you can try sliced cremini mushrooms. Gruyère cheese would make a delicious substitute for Swiss cheese in this recipe.